Here is the idea: we’d like (relatively) easy ways to integrate functions around simple closed curves. For the purposes of this particular note, we assume the usual about the closed curve (piecewise smooth, once around in the standard direction) and that the function in question does not have singularities along the said closed curve and only a finite number of isolated singularities in the simply connected region enclosed by the curve. 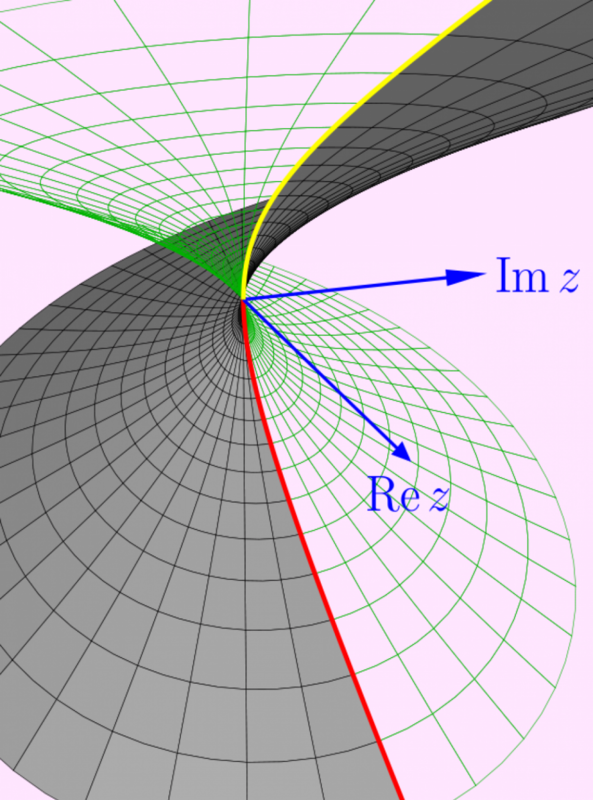 If we have no singularities in the said region, then our integral is zero and there is nothing more to do. Now by the theory of cuts, we can assume that the integral around the given simple closed curve is equal to the sum of the integrals of the function around small circles surrounding each singular point. So, integrals of this type just boil down to calculating the integrals of the function around these isolated singularities and then just adding. So lets examine a typical singularity: say . Let done the circle of radius surrounding and assume that is small enough that we don’t enclose any other singularity. Now the second integral is the integral of a power series (the regular part of the Laurent series) and therefore the integral is zero since we are integrating along a simple closed curve. So only the integral of the principal part matters. Now we can interchange integration and summation by the work we did to develop the Laurent series to begin with. Now for we note that has a primitive in the punctured disk. OR..if you don’t like that, you can do the substitution and find that these integrals all evaluate to zero. So all of this work shows that ; only the coefficient of the term matters. So now we see that the integral around our original closed curve is just , that is, times the sum of the residues of which are enclosed by our closed curve. This means that it would be good to have “easy” ways to calculate residues of a function. Now of course, we could always just calculate the Laurent series of the function evaluated at each singularity in question. SOMETIMES, this is easy. And if the singularity in question is an essential one, it is what we have to do. But sometimes the calculation of the series is tedious and it would be great to have another method. Example: calculate the residue of at . Now sometimes this is straight forward, and sometimes it isn’t. Now if where has an isolated zero at (as is the case when we have a pole), we can then write where both the numerator and denominator functions are going to zero. This should remind you of L’Hopital’s rule from calculus. So we should derive a version for our use. Now take a limit as to obtain which can be easier to calculate. Ok, my flight is boarding so I’ll write part II later. In this case, we want to calculate and . Like the previous example, we will integrate a specific function along a made up curve. Also, we will want one of the integrals to be zero. But unlike the previous example: we will be integrating an analytic function and so the integral along the simple closed curve will be zero. We want one leg of the integral to be zero though. The function we integrate is . Now along the real axis, and so and So the integral along the positive real axis will be the integrals we want with being the real part and being the imaginary part. and this goes to zero as goes to infinity. Note to other readers: if you know what a “residue integral” is, this post is too elementary for you. This is somewhat startling that the integral a related function along the boundary curve of a region determines the value of the function in that said region. And, this fact, plus this fact: where is the length of the curve and can lead to the solution to integrals of real variable functions. So because (think: magnitude of the integrand times the arc length). Now (provided, of course, that . So as goes to infinity, the integral around the entire curve becomes the integral along the real axis, which is the integral that we are attempting to calculate. Note that because is even, is continuous on the whole real line. This, of course, does not tell us what is but we can use Cauchy’s theorem to calculate the integral around the whole curve, which is equal to the integral along the entire real axis. So, in order to calculate the integral along the curve, we have to deal with where is NOT analytic. This means finding the roots of the denominator: that lie in the upper half plane (and are therefore contained within the curve when is large enough). There will be of these in the upper half plane. Label these roots . Now draw small circles around each of these ..the circles are small enough to contain exactly ONE . Within each of the circles, is analytic EXCEPT at that said root. Now here is the key: for each root , write where Then for all , by Cauchy’s Theorem ( is analytic within as we divided out the root within that region). Now by using the method of cuts, the integral around the large curve is just the sum of the integrals along the smaller circles around the roots. This figure is the one for . And YES, the always cancels out so we do get a real valued answer. I admit that calculation of can get a bit tedious but conceptually it isn’t hard. Let’s do this for and again for .